Sew Much To Say: Spring Sale and a Giveaway! Hello, lovely readers! Today is a beautiful day. Today is the first day of Spring! (Yipeeee!) 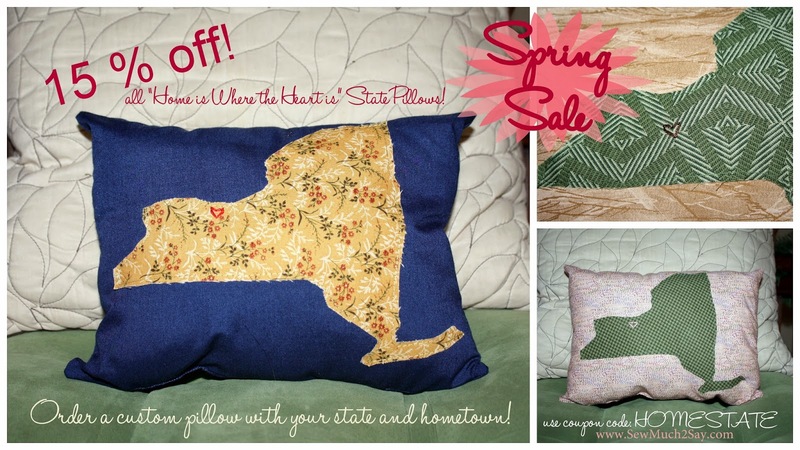 Anywho, in honor of the beginning of such a seemingly distant season, I am doing a State pillow giveaway AND having a State pillow Sale! All of my "Home is Where the Heart is" state pillows are 15% off this week. I also made a little vlog describing this sale and giveaway in a bit more detail because I'm an excited new vlogger. Happy 1st Day of Spring! I'm so ready for warm weather again. Cute pillows! I just love those reusable hand warmers... especially since it doesn't quite feel like spring in CT yet ;) Thanks so much for hosting this fun giveaway! !